Running The Race Before Us: Forget-me-not, Oh Lord! I started this blog because I needed a safe place to work through my emotions - at the time, mostly about the loss of our baby at 8 weeks. Journaling has always offered me a way to clear my head and work through things. I didn't really care who read it, or if anyone would read it. It just helped to get it all out there. I knew I wanted the blog to be in honor of our Angel, a way to never forget the blessing that was is that child. I hoped that it would be found by those going through something similar - so that my journey might help those ladies feel less alone in the world. In their journey of grief. I hope that's been and will continue to be the case. But like I just said, journaling helps me to work through things, so this blog is also about... well... anything in my life. 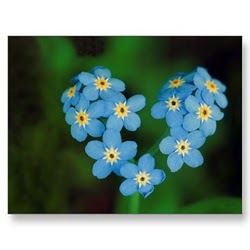 And so although I named it Forget-me-not, Oh Lord! because forget-me-nots remind me of my Angel Baby, it's also because as I'm working through my thoughts and feelings about each day, and so I don't want to forget the things that God is teaching me. I don't want to forget the blessings God sends my way - I don't want to forget the hard times and trials because even if He didn't send those, He allows them, and I believe it's for a purpose, so I don't want to forget those either! So I really do mean what my blog subtitle says, "I have created this blog in an effort to remember everything, everyone, and every day the Lord Jesus sends my way!" You don't have to read it, but if you do, it's about... me and my Lord Jesus, my awesome husband, my beautiful little girl, my angel baby, my church and that family, my job teaching English, my job coaching speech, and a lot lately about trying to conceive again for that rainbow baby. I guess this blog turned out to be more than I ever intended it to be! My prayer is that if you do read my mental ramblings, that God uses them to bless your life - either by finding someone you can relate to or something you can take away to use in your own life. Thank you for letting me share my life's journey with you! And thank you for reading!! In honor of my blog, I'm going to start a Friday tradition. Every Friday I will post something I have found online, share about someone I've met, or share about something that happened this week that I don't want to forget. First, last night when I was reading to Beth from her kid friendly bible, we read the part where Jesus goes up to Heaven. It showed His big mansion. Beth asked how she could go to be there with Jesus. I told her all you have to do is pray and ask, so I led her in the sinner's prayer. She asked Jesus to come into her heart, forgive her of her sins, so that one day she could be with Him! It was beautiful! I don't want to ever forget that moment, and my prayer is now that she never does either! I'm sure God will use that in her life!! The second thing I want to share has to do with a short video I found online. I had no idea there was a mother's day for baby loss mommas! This is an awesome video. Please watch. Let's not ever forget anyone who has suffered a loss. I'm glad to share in your journey Jamie! I always enjoy the honesty in your posts and I'm glad it's healing for you!